I used to be terribly against using the Trap Bar for any exercise at all and I was never really sure why. However, with time I started to use it more frequently for a wide variety of exercises. Well, lately I took a step back and wondered why I had so much hate for the Trap Bar in the beginning. What I realized is sort of disturbing. There is really no reason to hate the Trap Bar. I was listening to so many of these “Macho-Man Only” style lifters that only believe in doing things their way and I forgot to really look at the science behind lifting and the loads that certain lifts can put on your body when not executed perfectly. Let’s face it, if you’re a human and you’ve ever been in the gym I’m sure you’ve at least heard one person diss on the Trap Bar. Matter of fact, I’ve dissed the Trap Bar myself a few times. No, I’m not proud of that necessarily…especially after a pretty in depth search for information on proper usage of this essential piece of equipment. It’s interesting to note that even when scouring the internet for information I managed to stumble upon multiple blogs or forums that spat at the idea of using the Trap Bar in your workout. One such resource flat out says “We ARE a bunch of Wussies” when referring to people believing that deadlifts can be dangerous for your spine. The problem I have is that I have done countless hours of research and watched countless of videos on proper deadlift form, and even I mess myself up once and a while and slightly jam up my back. This happens even with great form and not extreme weight. Now I know this may be partially because my spine just might not be able to handle this pressure, but that’s exactly my point in writing this article. In recent years it seems that the rising popularity of fitness forums and internet resources has led to a lot of misinformation. This also allows for anyone with a computer and an internet connection to offer their opinions on subjects. I’ve talked about this phenomenon a couple times and one specific article that touches on it can be found here. For some reason, a large quantity of lifters out there only believe in doing things the “old-fashioned” way where you have access to just a couple pieces of equipment and some plates. You slap the plates on a barbell and that’s all you need. While it is easily agreeable that there are a few major compound lifts that can keep you healthy, in shape, and build muscle effectively…I don’t believe that we should completely ignore science and the development of new technology. The “barbell-only” mentality that has surrounded weight lifting lately can be distasteful for beginner lifters and even those who have some experience in the gym but pull in a large majority of their advice from the biggest guy they can find. Who Are Barbell Lifts For? The answer is still everyone. While I am clearly advocating for the Trap Bar here, I’m not completely disowning my trusty friend the barbell. I actually perform more barbell lifts than anything else when I’m in the gym. Barbell lifts are some of the best lifts for Hypertrophy and overall muscle growth. Most engage your core, hip flexors, and usually target a large majority of muscle groups. Scott Herman has always been a great resource for form and I highly encourage you check out this video below if you are unsure of proper deadlift form. However, sometimes barbell exercises, and deadlifts in particular, may not be the right call. Barbell deadlifts specifically have been repeatedly proven to be most effective for shorter lifters with longer arms. Many of the people you see tearing apart the Trap Bar have the perfect frame for barbell deadlifts. How often is it that you see a guy around 5’8″ and 225 lbs pulling massive amounts of weight on the bar? All the time. Now think about how often you see a 6’0″ 175 lb guy pulling massive weight? Not very often is my guess. We are discussing barbell lifts in general though, not just deadlifts. What are other options for all the taller lankier folk out there? Sumo Deadlifts – These are a great option for those that need a wider stance to pull the bar. While the same exactly muscle groups are not engaged, you can focus a great deal on your back without too much worry. Please pay close attention to your form when first trying Sumos, and keep your weights light until you get them down. Rack Pulls– Rack pulls are another great option when pulling weights or looking for alternatives to deadlifts. This exercise can still engage your hamstrings and compliments Sumos very well in my opinion. If you perform both of these back-to-back it’s likely that you will still see good results with proper technique. So with those options… were does the Trap Bar come into play? Why Would You Use The Trap Bar? 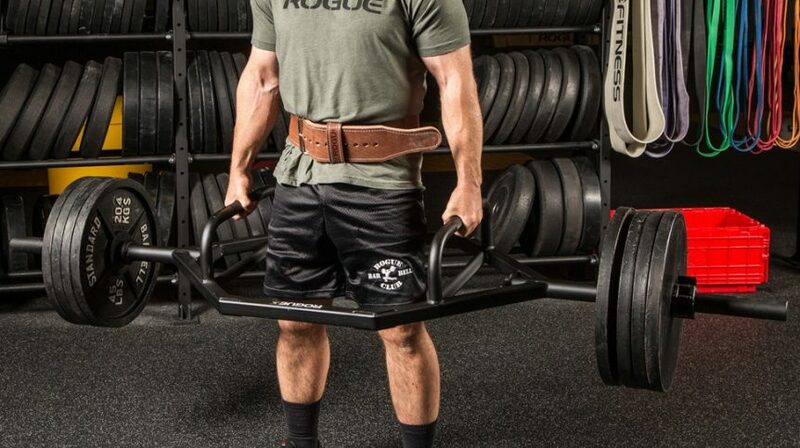 With scientific research that directly proves less engagement of back muscles when using the Trap Bar for deadlifts, why the heck would anyone really want to use this at all? The fact is…no matter how close you have a barbell to your shins when performing something like the deadlift, the weight will not be directly in line with your center of gravity. This exact issue is why so many people injure themselves while deadlifting every day. Many don’t understand the torque that a heavy bar hanging out in front of you applies to your lower back. If you have ever studied forces and physics, you will easily be able to realize that the acting force is greater on the fulcrum point (your hips) the further you get away from it (length of radius arm). If you haven’t studied these things, that’s no worry. Imagine you are on a diving board. When you jump directly on top of the springs what happens? Usually, minimal or no movement. When you move away from these springs the board flexes, the springs engage, and the torque that you apply to the end of the board is actually much greater from the perspective of those springs. Same with deadlifting. As you extend the bar further and further away from the shins, you increase the amount of torque placed on the lower back. How does this apply to the Trap Bar you ask? Sensitive groups and beginners should most definitely use this bar while building strength in their lower backs. In my opinion…those with longer legs should rely heavily on the use of the Trap Bar. If you don’t believe in the use of the Trap Bar because you don’t think it gives you the same powerful lift that a barbell does, then only work it into your routine every couple of weeks for muscle confusion. Also, the Trap Bar doesn’t strictly have to be used for strictly deadlifts. There are tons of resources out there that will help with plenty of creative ideas when you are in a routine rut. Don’t ditch the straight bar lifts… but don’t over exert yourself or go after too much of a weight increase at once. Work your way up carefully and have a very calculated way of going about it. If you are extremely dedicated to building your strength in this area, I suggest giving this starting strength workout a shot. If you want the best all around results…I say mix it up. Use the straight bar one week, and then blast a heavier set with the Trap Bar the week after. Remember, when it comes to big lifts, there is no better tool than a strong back and a good belt. I do have one ask… Please share this with the next guy that tries to make you feel bad about using the Trap Bar for any exercise in place of a barbell. Let him jump on here and discuss his feelings about it in the comments and proceed to tell me all about his “natural” muscle growth. Every person is an individual, with different experiences and opinions. I am always open to discussing those opinions here in the comments. If you have questions specific to you or your body type, even if I can’t answer them I will do my best to point you in the right direction. With that being said, feel free to email me at dalton@incitefitness.org or head over to the Incite Fitness Facebook Page and shoot me a message. If that doesn’t suffice and you’re more into the photo aspect of things, check out the Incite Fitness Instagram Page and double tap a few photos. It is an interesting article, it is true that you can hear many myths on the gym or the internet when you discuss ways to improve your body. So, it makes sense to hear some myths about trap bar too. There are many successful athletes who have trap bar training on their daily or weekly routine. If it works for them, it can work for anyone. In your opinion, are there any good trap bar exercises for total beginners? Appreciate you reading, and appreciate the question. First, I 100% agree the trap bar is present in a lot of elite athlete’s workouts. Science doesn’t usually lie. I thoroughly enjoy when things are supported by some solid facts and proven results. In my opinion I would say they are great for total beginners. Especially when you are first learning to do deadlifts. This would be the best workout to start on the trap bar with while you get familiar with what the transition from pulling with your legs to your back feels like. Let me know if you have any more questions! I highly suggest checking out the video I posted above that speaks to form before you try them. Thanks for reading. Definitely give it a shot. I have felt how much more explosive I am in other workouts after a couple weeks of using the trap bar. Keep up the hustle in the gym my friend.